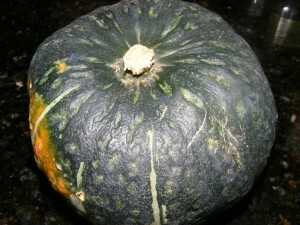 Kabocha is a Japanese pumpkin. Kabocha is actually just the Japanese word for squash. It’s dark green (though it can have orange-y spots too) and hard. The inside is orange. It hardens as it ripens. I once bought a few kabochas from a sketchy place that were not ripe (they weren’t sweet, and they were much easier to cut) but I didn’t realize it until after I had cut into them. This only happened once, so I wouldn’t worry too much about it. You can usually find them at an Asian market but I’ve seen them at the farmers’ market and Whole Foods as well. In season they’re as low as $0.50/pound, but anything under $1/pound is a good price (I’ll go up to $1.30 or so at the max). Kabocha are usually about 2-3 pounds (the ones I get are around 2 pounds), but I think that they can get much bigger than that. 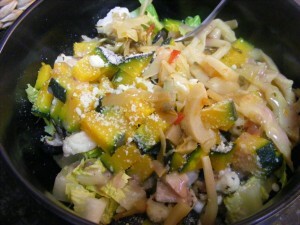 I often eat a whole kabocha in one day. It hasn’t turned me orange (yet). I think they’re slightly more starchy than a butternut, but taste way better (IMHO). Kabocha are high in beta carotene, vitamin C, vitamins B1 and B2, and more. I’ve found different nutritional info online. 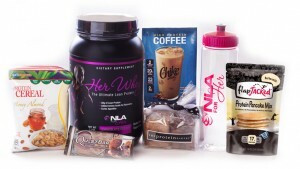 This site lists it as 60 calories per 100 grams (544 calories per 2 pounds), but this site lists it as 30 calories per 85 grams (320 calories per 2 pounds). Too much confusion, and I don’t care anymore – just give me my kabocha 🙂 They are a great part of a healthy macrobiotic diet. 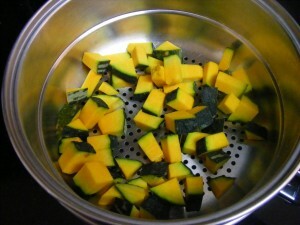 My favorite way to cook it is to steam the kabocha. I cut it up in chunks (throwing away the seeds, but you could roast them if you wanted to) and steam it for about 5-7 minutes. You should be able to pierce it quite easily with a fork when it’s done. I usually top mine with parmesan, brown sugar, and/or earth balance/butter (any mix of the 3). 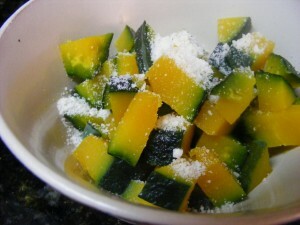 You can also toss the steamed kabocha in a salad, topped with more parm of course (or not). This salad was a base of romaine, plus sauteed veggies (cauliflower, shiitake mushrooms, daikon), steamed kabocha, pickled lettuce (something I got @ the Chinese market), parmesan, and the last of my tj’s raspberry vinaigrette. 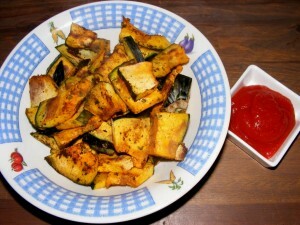 Another great way to enjoy kabocha is kabocha fries. In this case you can follow the directions for my butternut squash fries, or you can simplify it a bit by microwaving the kabocha chunks for 5-7 minutes, then sticking them under the broiler for 5 minutes or so (until they get crispy). Coco has tried the microwaving version and she liked the way they turned out. Try dipping the fries in my homemade unsweetened ketchup. Divine.